Alar rim retraction (or notching) is one of the most common complications of primary and secondary rhinoplasty. [4, 5, 6, 7, 8] Alar rim retraction can also occur in the patient without previous nasal surgery. Alar rim retraction is typically due to arching, malpositioning, or surgical weakening of the lateral crura. The prevalence of alar rim retraction is difficult to assess. The condition is more common in patients with previous rhinoplasty or nasal sidewall cutaneous surgery history. Indications for the surgical correction of alar rim retraction include aesthetic deformity, patient request for a change in nasal shape, and improvement of anatomic nasal airway obstruction. Causes of alar rim retraction include hereditary or familial, congenital, traumatic, or iatrogenic (eg, unfavorable result from previous rhinoplasty) conditions or events. Rhinoplasty is the most common cause of alar retraction that requires surgical attention (see the image below). 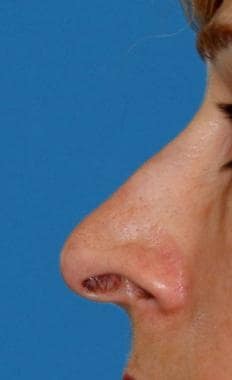 Long-term scarring of the nose can displace components of the nose. The displacement vector is usually toward areas of structural and volumetric deficits. Cephalic excisions of alar cartilages invariably result in some degree of alar retraction by virtue of the dead space created and by cephalic scarring. Fortunately, with conservative excision, the degree of retraction is not aesthetically or functionally noticeable. Local nasal sidewall area excisions (for instance for skin cancers) can also cause alar rim retraction. In more aggressive cases of cephalic excision, alar retraction can become clinically apparent. Excision of alar vestibular skin and intranasal mucosa can further contribute to retraction. Vertical dome division and various cartilage-splitting techniques, when combined with cephalic alar excisions, can cause cephalic alar rim retraction. Caudal upper lateral cartilages or scroll resection in the setting of concomitant alar cartilage excision encourages notching. Inappropriately placed interdomal suturing can recruit the lateral aspect of the alar cartilages cephalically and inadvertently create alar arching. Caudal alar cartilage excisions are rarely performed because they can produce unnatural alar contours and can lead to notching. Acquired alar rim retraction can be caused by too alar excision, alar cartilage division, excision of too much alar sidewall mucosa, and alar skin excision. Primary alar retraction can be due to overarching alar cartilages that are often long and plunging, as well as to alar cartilage malposition. Alar retraction can also be part of normal nasal anatomy. Long and arched lateral crura (of the alar cartilages) can give a snarled and retracted look to the rim (see the image below). An overdeveloped quadrangular cartilage combined with a high arched ala can further exaggerate the amount of columellar show. Minimal-to-moderate alar notching is noticeable on certain tension noses. Cephalically positioned alar cartilages can also present with alar notching. Other combinations can present with mild-to-moderate alar retraction in an otherwise normal nose. True alar rim retraction with normal columellar position should be differentiated from cases of columellar excess with normal alar rim position. Both cases present with alar-columellar disproportion but require different treatment. Anesthesia for the alar rim correction and rhinoplasty depends on the surgeon’s preferences. Deep intravenous (IV) sedation (eg, with propofol), monitored anesthesia care, and general anesthesia carry different risks and benefits. With any method, depositing local anesthetic with diluted epinephrine (1% lidocaine with 1:100,000 epinephrine) can help ensure the desired vasoconstriction, hydrodissection, and local anesthesia. It is important to use just enough local anesthetic to achieve the desired pharmacologic effect while minimizing tissue distortion. Depositing the local anesthetic in the proper locations and into avascular areolar tissue planes is key. This can decrease bleeding, facilitate tissue dissection, reduce surgical trauma, and ease execution of the surgical plan. The use of intranasal pledgets soaked with a vasoconstrictive agent (eg, 4% cocaine solution, oxymetazoline) can facilitate endonasal decongestion, decrease intranasal bleeding, and provide additional local analgesia (eg, if cocaine is used). The typical first steps in a successful rhinoplasty include (1) a careful preoperative analysis of the patient’s concerns and nasal deformities and (2) the generation of a problem list. Accurate preoperative diagnosis of both aesthetic and functional problems can then facilitate appropriately targeted rhinoplasty maneuvers. Questions about nasal function are paramount, especially in patients who have alar retraction. When functional issues are recognized preoperatively, nasal surgery generally has a better chance of improving patients’ nasal airways. The physician has the responsibility to diagnose and educate the patient about any existing functional deficits. Aesthetic goals in rhinoplasty depend on the patient’s requests, the patient’s nasal anatomy, and the surgeon’s recommendations based on aesthetic ideals. Imaging computer programs can be helpful in communicating with the patient. Standardized photographs of the patient are essential for the preoperative diagnosis and the development of a surgical plan. High-quality patient photographs can be taken with a 35 mm camera or with digital photography techniques. Preoperative analysis of patient photographs allows the surgeon to define problem areas of the nose that may have been missed during the initial physical examination. In addition, specific structural and anatomic deficits may become more apparent in certain photographic views. Close-up images of the alar rim against a blue background can help reveal the exact degree of retraction. In patients with alar rim retraction, studying lateral view photographs is important to ascertain the presence of true alar retraction versus other types of alar-columellar disharmony. On the lateral view, the ideal nostril is oval, with the alar rim forming a gentle curve that forms the superior border; the columella should lead the alar rim by 2-3 mm (defined as columellar show). 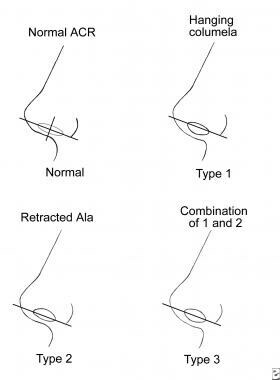 Several types of alar-columellar disproportions exist; one of which is an isolated alar retraction (see the image below). For instance, a hanging or dependent columella with a normal ala may be mistakenly identified as alar rim retraction. Normal and variant alar-columellar disproportions. 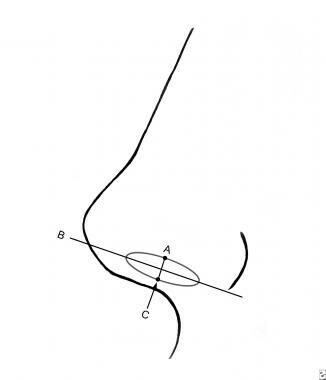 According to Gunter, alar-columellar disproportions can be quantified by comparing the long axis of the nostril with the perpendicular alar-columellar distance (see the image below). A columella-to-nostril-axis distance of less than 1 mm suggests alar retraction. A columella-to-nostril-axis distance of 2 mm or more suggests a hanging columellar deformity. A retracted ala and a retrusive columella can be present, and each must be addressed during surgery. In a normal alar-columellar relationship, the distance AB = BC = 1-2 mm. Radiologic workup is usually not indicated for nasal tip rhinoplasty. Nasal endoscopy can help diagnose posterior septal deviation and other intranasal pathologic conditions. An easy method for correcting minor alar retractions involves the application of alar batten grafts, which not only support the alar sidewall but also can push down the alar rim, thus reducing the amount of retraction. Undermining the lower lateral cartilages from their vestibular and cutaneous attachments to facilitate such alar repositioning is important. Dissecting caudal to the alar cartilages can also create a pocket for caudal displacement. In addition, excising or releasing previous scar tissue can allow grafts to push down the ala. Suture-secured lateral crural onlay cartilage grafts can be positioned to lower the rim. Often, the addition of alar rim grafts can add bulk and further lower the alar rim. A well-placed robust alar rim graft alone can straighten mild alar notching. Alar grafting can also serve to prevent future retraction in primary and secondary cases. Lateral alar base resections can lower the ala but may create an undesirable partial alar hanging deformity in which the ala inserts into the face. Most of these maneuvers can be performed alone or in combination to yield 1-3 mm of rim lowering. For more significant alar retraction correction, other techniques are necessary. Severe alar retraction may also necessitate placement of composite dermal-cartilage grafts to the alar vestibule. Such grafts are harvested from the ear and contain cartilage, with its overlying skin, on 1 side only. They are harvested from specific locations on the pinna that match the curvature and contour of normal alar cartilages. A common harvest location is the anterolateral surface of the auricle, inferomedial to the inferior helical crus. 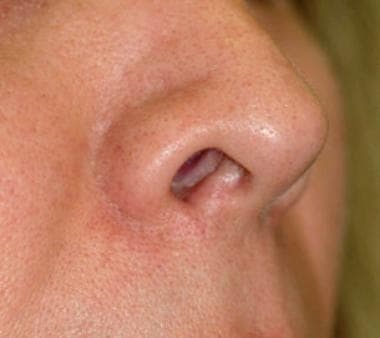 When transplanted into the nose, the cutaneous component of the graft faces the nasal vestibule (see the image below). Composite grafting can be especially useful when too much vestibular tissue has been excised. It is also useful in revision cases in which the nasal sidewall is too atrophic and thin to envelop alar batten grafts. To prevent vascular compromise, composite grafts should be secured with interrupted sutures under minimal tension. A 3- or 4-quadrant placement of 5-0 mild chromic catgut interrupted sutures is usually adequate. The skin component of the composite graft should be about 20% smaller than the underlying cartilage. 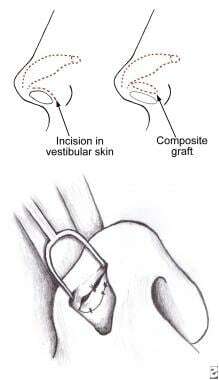 This design ensures a seamless incorporation of the graft into the created vestibular pocket and ensures the survival of the skin component of the graft. The graft should be designed as an oval with adequate size to impart an inferior push to the alar rim. Through-and-through bolster placement from alar skin to the graft can be useful when adequate intranasal suture securing of the graft becomes difficult. The cotton bolster is placed on the external aspect of the nose, and the suture is fixated, but not tightly. Composite grafting can be performed in conjunction with rim graft placement or other maneuvers to lower the ala (see the image below). Repeated composite grafting can be performed in stages to lower severe alar rim retraction. Mild alar retraction can be temporarily corrected with the injection of dermal fillers. The author has had success with the use of a nonanimal stabilized hyaluronic acid gel (Restylane) to improve alar rim contour in both primary and secondary noses. The results typically last for less than 12 months, but the procedure can be repeated as needed. Although dermal filler injection is not a substitute for surgery, it can provide a temporary solution for patients who do not wish to undergo surgery. This is especially true for patients who have become jaded as a result of previous unsuccessful rhinoplasty attempts. In some cases of iatrogenic (postsurgical) alar retraction, local dermal fillers have been used to temporarily correct slight degrees of alar retraction. In the author’s opinion, only hyaluronic acid–based fillers (ie, Restylane and Juvéderm) should be used for this purpose. Such fillers can be reversed with hyaluronidase, and they do not change the tissue planes. 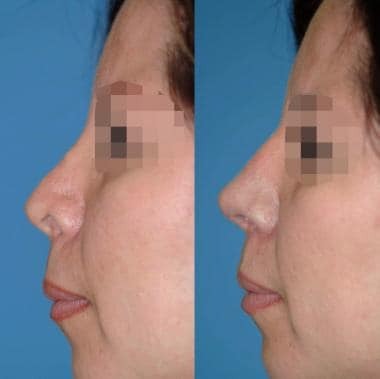 The author has operated on noses previously injected with longer-lasting fillers (eg, Radiesse) and has noted calcifications, extra scar tissue, and completely altered tissue planes that have made the surgical approach to the nose needlessly difficult. Accordingly, the author, in common with most revision rhinoplasty surgeons, believes it is incorrect to inject any semipermanent or tissue-altering dermal fillers into the nose. In patients who have had grafts placed in the alar area, meticulous intranasal application of antibiotic ointment several times per day can help reduce intranasal debris and speed up healing. Although rarely used, bolsters placed to keep a composite graft in place are removed on postoperative day 5. Nasal packings and systemic antibiotics are not routinely used. If nasal packs are placed, oral antibiotics are started to reduce the risk of toxic shock syndrome. Nasal packs are removed before discharge and are almost never left in place for more than 24 hours. Plastic or silicone intranasal splints are placed in patients who undergo septal work or in those who may be at risk for intranasal synechiae. With an uncomplicated septoplasty, the intranasal splints are removed with the cast in 5-6 days. The author’s practice is to arrange visits at 1, 3, 6, 9, and 12 months after the rhinoplasty. After the 12-month visit, yearly visits are encouraged, and photographs are taken to document the subtle changes in nasal appearance. Observing and studying these changes (both favorable and unfavorable) provide the surgeon with an invaluable education. Mild-to-moderate degrees of alar notching can be reliably and permanently corrected with cartilage grafting. Rohrich and colleagues studied the use of alar cartilage grafting for alar retraction in 123 patients and found that 91% of patients who underwent primary rhinoplasty experienced correction or prevention of alar notching or collapse. In revision rhinoplasty cases, correction was achieved in 73% of patients. The rate of alar retractions can be reduced by avoiding significant alar cartilage and alar vestibular excisions and by reinforcing the alar rim after rhinoplasty surgery. When alar notching presents in patients, cartilage grafting can be used to lower the alar rim to a more ideal position. The reported rate of revision surgery in primary rhinoplasty for functional or aesthetic purposes ranges from 5% to 18%. The complication rate for difficult secondary rhinoplasties may be up to twice that observed in primary cases. The rate of medical complications (infections, postoperative bleeding) due to rhinoplasty surgery is 1-5%. The long-term rate of isolated alar retractions postrhinoplasty is hard to estimate but, if carefully analyzed, may be higher than is commonly estimated. Prevent injury to your nose. Minimize all activities and be very careful. Avoid blowing your nose. Wipe your nose gently with tissues. If you sneeze, try to keep your mouth open. Change the dressing (if you have one) under the nose as needed. Avoid extreme physical activity. Strive for more rest than usual and avoid exertion. Brush your teeth gently with a soft toothbrush only. Avoid manipulating your upper lip, which helps keep your nose at rest. Avoid smiling or excessive facial movements for 1-2 weeks. Wear clothing that fastens in front or back for 1 week. Avoid slipover sweaters, tight t-shirts, and turtlenecks. Avoid foods that require prolonged chewing. This is the only dietary restriction related to the rhinoplasty. You may wash your face but avoid getting the nasal cast wet. Do not wash your hair for 1 week unless someone can do it for you. Do not get your nasal dressing wet. Absolutely avoid tanning for 6 weeks after surgery. Do not wear regular glasses or sunglasses that rest on the bridge of the nose for at least 3 weeks. You may tape the glasses to your forehead. After the physician removes your nasal plaster cast, the skin of the nose may be cleansed gently with a mild soap or a hypoallergenic or mild skin lotion. Guyuron B. Alar rim deformities. Plast Reconstr Surg. 2001 Mar. 107(3):856-63. [Medline]. Totonchi A, Guyuron B. Alar Rim Deformities. Clin Plast Surg. 2016 Jan. 43 (1):127-34. [Medline]. Daniel RK, Palhazi P, Gerbault O, Kosins AM. Rhinoplasty: the lateral crura-alar ring. Aesthet Surg J. 2014 May 1. 34 (4):526-37. [Medline]. Tardy ME Jr, Cheng EY, Jernstrom V. Misadventures in nasal tip surgery. Analysis and repair. Otolaryngol Clin North Am. 1987 Nov. 20(4):797-823. [Medline]. Alexander AJ, Shah AR, Constantinides MS. Alar retraction: etiology, treatment, and prevention. JAMA Facial Plast Surg. 2013 Jul-Aug. 15(4):268-74. [Medline]. Losquadro WD, Bared A, Toriumi DM. Correction of the retracted alar base. Facial Plast Surg. 2012 Apr. 28(2):218-24. [Medline]. Ballin AC, Kim H, Chance E, Davis RE. The Articulated Alar Rim Graft: Reengineering the Conventional Alar Rim Graft for Improved Contour and Support. Facial Plast Surg. 2016 Aug. 32 (4):384-97. [Medline]. Patel A, Knoll BI, Persing JA. A congenital cleft of the alar rim. Plast Reconstr Surg. 2009 Feb. 123(2):67e-69e. [Medline]. Kim DW, Toriumi DM. Nasal analysis for secondary rhinoplasty. Facial Plast Surg Clin North Am. 2003 Aug. 11(3):399-419. [Medline]. Becker DG, Tardy ME Jr. Standardized photography in facial plastic surgery: pearls and pitfalls. Facial Plast Surg. 1999. 15(2):93-9. [Medline]. Gunter JP, Rohrich RJ, Friedman RM. Classification and correction of alar-columellar discrepancies in rhinoplasty. Plast Reconstr Surg. 1996 Mar. 97(3):643-8. [Medline]. Ercan I, Dizdar D, Erdogan B. The strengthened stair-step technique for correction of lateral crural malpositioning. Aesthetic Plast Surg. 2014 Oct. 38 (5):869-75. [Medline]. Kridel RW, Konior RJ. Controlled nasal tip rotation via the lateral crural overlay technique. Arch Otolaryngol Head Neck Surg. 1991 Apr. 117(4):411-5. [Medline]. Cochran CS, Sieber DA. Extended Alar Contour Grafts: An Evolution of the Lateral Crural Strut Graft Technique in Rhinoplasty. Plast Reconstr Surg. 2017 Oct. 140 (4):559e-67e. [Medline]. Tardy ME Jr, Toriumi D. Alar retraction: composite graft correction. Facial Plast Surg. 1989 Winter. 6(2):101-7. [Medline]. Rohrich RJ, Raniere J Jr, Ha RY. The alar contour graft: correction and prevention of alar rim deformities in rhinoplasty. Plast Reconstr Surg. 2002 Jun. 109(7):2495-505; discussion 2506-8. [Medline]. Seeley BM, Denton AB, Ahn MS, Maas CS. Effect of homeopathic Arnica montana on bruising in face-lifts: results of a randomized, double-blind, placebo-controlled clinical trial. Arch Facial Plast Surg. 2006 Jan-Feb. 8(1):54-9. [Medline].